Parbat Suja Padhariya is an organic cotton farmer with Agrocel. He’s been farming organically for around ten years. 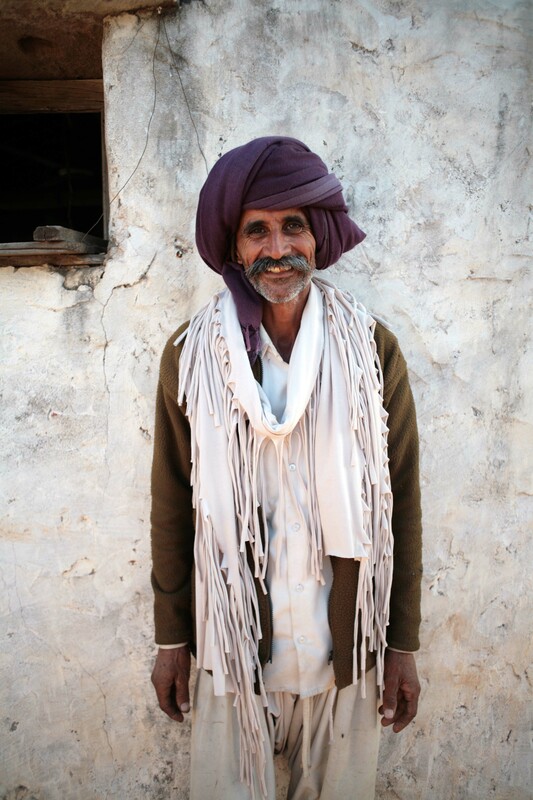 Parbat owns a 7 acre farm and earns around £1,500 – £2000 per year. Safia visited Parbat on his farm in 2013, to see a video of this trip click here. Parbat is 56 years old and has three children, two sons and one daughter, 15, 17 and 20. Parbat, when did you decide to switch to organic farming? I started working with Agrocel in 1997, and then fully switched to organic farming methods in 2003. How has working with Agrocel made a difference to your life? Agrocel supports me by giving me agricultural technical guidance as well as support through the marketing of organic cotton and other organic products for better prices. What kind of technical guidance has benefited you? Agrocel provides guidance on how to maintain healthy and fertile soil as well as training programs on how to improve the quality of my crops. How have these improvements helped your family? We are members of the Agrocel Farmers Association, through the association we get a number of benefits. We get the best quality of non-GMO seed as well as insurance for all farmer members. We also receive a Fair Trade premium which we used for harvesting water, this supports a water drinking facility for us and our animals, and the premium also helps with the maintenance of our water well which we use to irrigate our farm. What problems does the conventional cotton farmer face? I’ve been farming organically for many years now, but I think conventional farming requires more water and because of synthetic fertilisers the soil becomes damaged due to the use synthetic materials. As you’re growing cotton without chemical fertilisers and pesticides, what do you use instead and how does the soil benefit? To fertilise the soil we use castor and neem (which grow locally and organically) and farm yard manure. For pest control we use neem oil; we also make our own organic pest repellent from mixing local plant oils and leaves. What other crops do you grow? I grow fodder for the animals, vegetables as well as sesame, mustard, millet and castor, if there is heavier rains, then we grow cumin spice and wheat. Which is your favourite organic vegetable and how do you eat it? We eat spicy food, I like to grow chilli, aubergine, cauliflower, onion, and beans. The vegetables I grow normally are for home use and not for sale. What’s the most needed thing in your community now? What do you plan to spend Fair Trade premiums on? The use of the Fair Trade premium is a democratic decision between all the farmer members. Agrocel is supporting the implementation of that premium. We have a problem with water due to lack of rain, the major benefit we got from the project is water harvesting and water saving infrastructure, this was built as a long term strategy, and help us mitigate the impact of climate change on our crops. We have also used the premium for different things like health check-ups for farmers, as well as veterinary checks for our animals. Environmentally for organic cotton seed production, tree plantations, water saving, bird feed and social forestry projects. The premiums help the local schools for different activities for children’s education. Economically, we bought a tractor to help small farmers with tillage to saving the labour cost and also a truck to transport our crops from the farm. Do you have any special message to Safia and the buyers of your organic cotton clothing? Thank you to People Tree and your customers for their support though Agrocel and for understanding our hard work and the correct value of our organic and Fair Trade cotton.